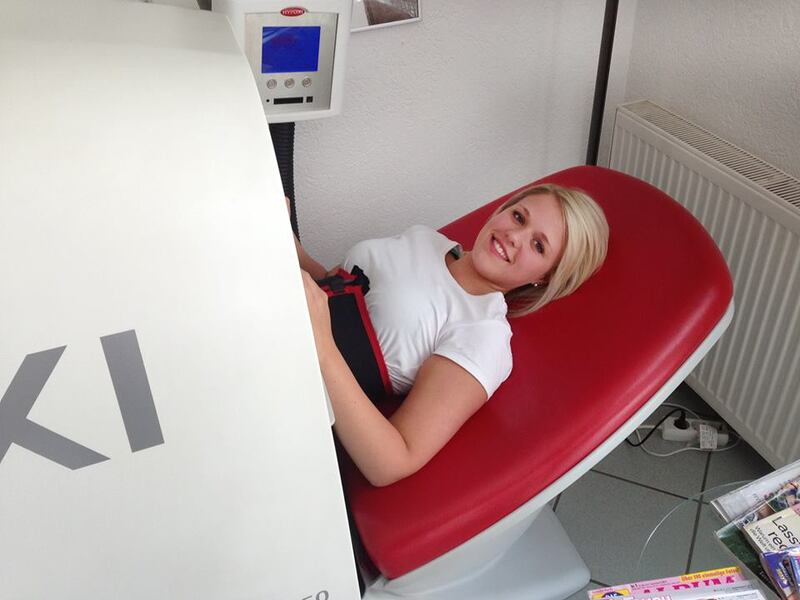 Karen Windsor, volunteer at Talk Lipoedema, took part in a Lipoedema study at HYPOXI-Studio Chiswick. She is very active in increasing awareness of the disease. In her own words she shares her experience with us. “My name is Karen Windsor and I’m diagnosed with lipoedema and other lymphatic disorders. I started using HYPOXI, my journey has been great, with mostly ups. The only thing that I struggled with is my knees, unfortunately they are damaged through years of miss diagnosis. I’ve got osteoarthritis. 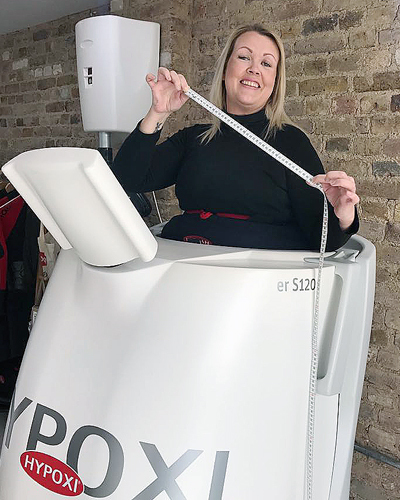 When I first started HYPOXI couldn’t put my knees together because of the lipoedema fat (fat pads), after a month this greatly reduced and to my delight I could. I remember the day I started and my measurements, Maria said put your knees together and I couldn’t, I just thought this was normal, a month later my measurements day came and I could suddenly put them together, it was such an achievement I cried. Something so silly was something so great to me. At the start, I was convinced because the weight wasn’t shifting that this wasn’t working, yet I was following everything to the latter including adding my own methods. It was another measurements day, to my great surprise I’d lost over 40cms it was nearly a month and 1/2 into the program, I was so over whelmed I phoned Maria in tears, I had to thank her for giving me this opportunity it was the best present ever. I started to feel stronger I noticed so many changes in my body from look to feel to pain decrease. I also have fibromyalgia and I can honestly say the symptoms have changed so much. Even my rheumatologist was shocked. Dorota at the Chiswick branch was my coach, my friend, my backbone, she helped me no end with this journey. I’m so utterly grateful to HYPOXI for helping me change the dimensions of these illnesses, this isn’t a cure, there is no cure but you can certainly turn the clock back on all of this. Life is for living and after 30 operations and years of pain close to full disability using braces and crutches etc I found HYPOXI, nothing has worked for me like this treatment. I continue to fascia blast, eat a ketogenic diet and do low impact exercise and lift weights. I believe HYPOXI combined with my own methods is what has helped me change my life, my trial is over now but I’m continuing on with my methods, now that my body is fully metabolised thanks to the clever science of HYPOXI. I did 36 sessions this is my reveal my journey. If you want to follow how I will maintain and take the loss further follow me at @kazzzyb_talk_chick. Since finishing my HYPOXI-Treatments, I’ve been following my own methods because of how HYPOXI has metabolised my body. In total, I lost 58.5cms from the lower half of my body through HYPOXI. HYPOXI gave me a gift and I’m determined to make this work, I might have to go back to HYPOXI one day but if I do I know this treatment works. It’s not invasive surgery, it carries no risks. I can do a session and go back to my life, no recovery time. Take the first step to a new body sensation – the first training at an authorized HYPOXI-Studio is completely free and without obligation! Lipoedema suffers are severely restricted in their quality of life. Neither starvation diets nor sports activities can stop this chronic and progressive desease, affecting approximately 10 % of all women. Often, the consequences are eating disorders and in an advanced stage orthopaedic problems of the spine and joints. Dating problems and blasphemy by fellow human beings lead to desperation and feelings of guilt. The unique mechanism of the HYPOXI-Method can sustainably increase the quality of life of those affected by lipoedema. The HYPOXI Lipoedemastudy and our many years of experience in the HYPOXI-Studios show that the unique mechanism of the HYPOXI-Method can sustainably increase the quality of life of those affected by lipoedema. The HYPOXI-Method with its innovative combination of underpressure and overpressure treatment as well as the effective training enables significant weight loss and circumference loss at the relevant parts of the body. As a result, the painful symptoms of lipoedema can be reduced and the external appearance positively influenced.